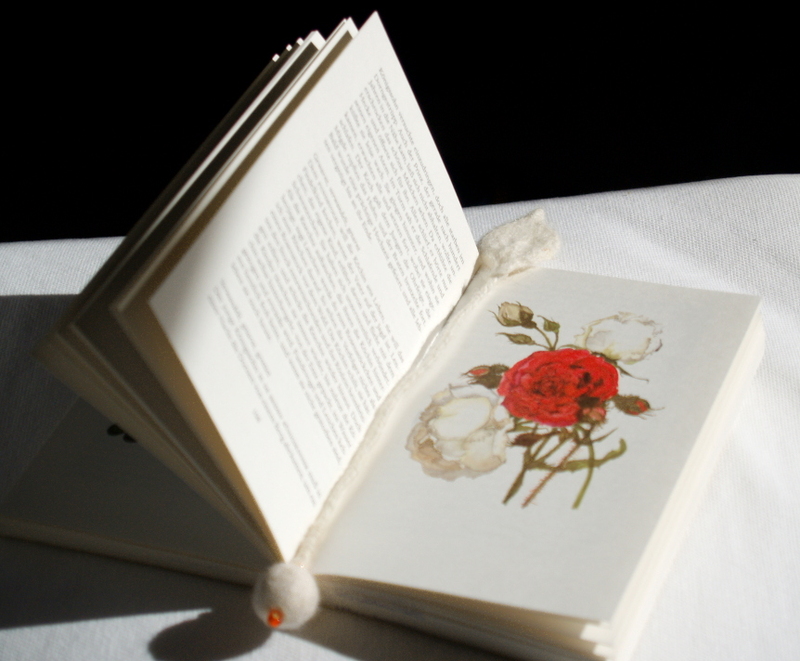 A knitting needle holder, a lovely bookmark, a sweet decorative thing for your gift-wrap-ideas. 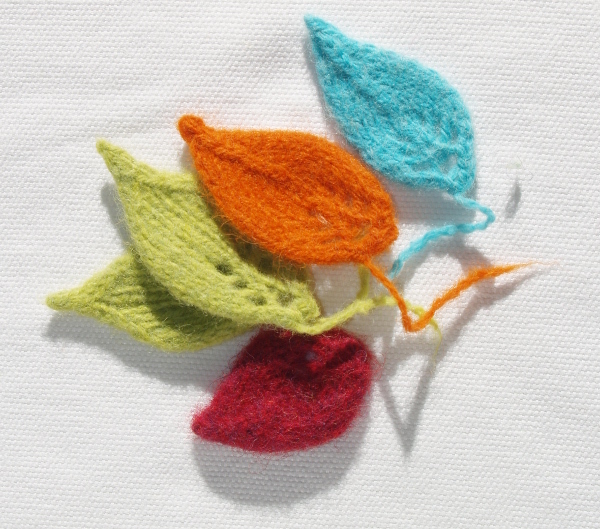 This is the new Clever felt and leaf pattern! The flexibly wire can serve many purposes, for fastening something or hanging it up. A small project with a lot of joy and clever ideas. 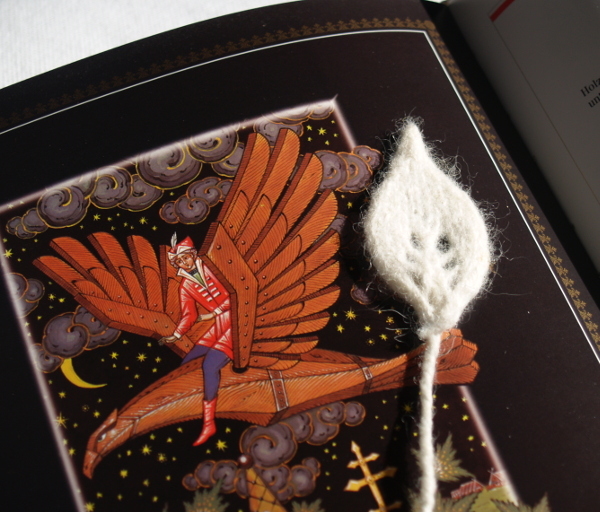 The pattern instructions include two parts, the knitting instructions and the finishing with a photo tutorial for the felt wire. 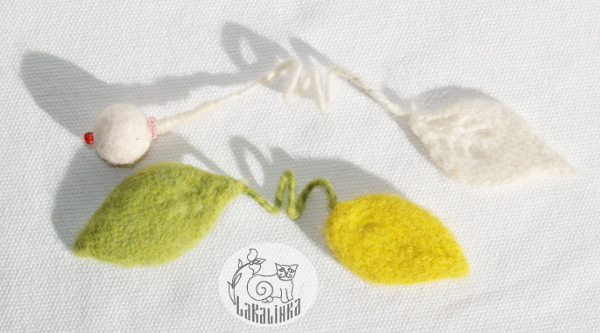 An organic yarn, suitable for felting (not superwash labeled). Suggested: 100 % wool, alpaca, wool/alpaca blends. For example: Ístex Plötulopi / Unspun Icelandic, 100% Wool. 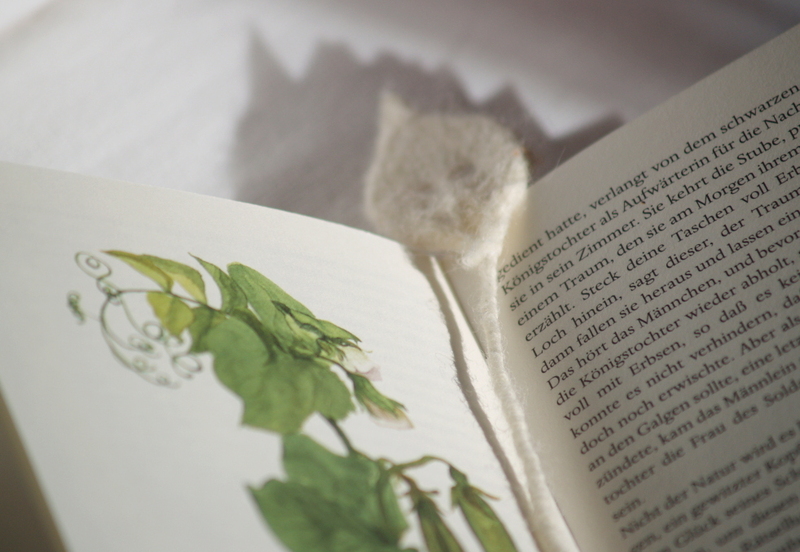 Garnstudio Drops Flora, 65% Wool, 35% Alpaca, 230 yards (210 meters)/ 50 grams. Gauge: an exact gauge is not critical for this project. 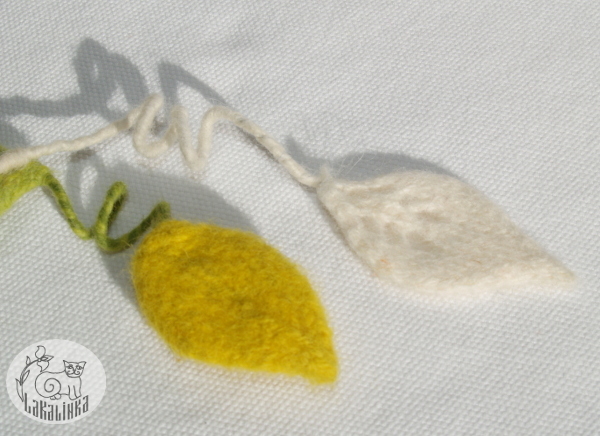 My photo tutorial How to make felt beads here. Centered double decrease – cdd, a.k.a. Double vertical decrease. This method decreases two sts and creates a vertical stitch. Slip 2 sts tog, k1. Insert the left needle into the stitches be slipped. Pass over the two stitches together. Using two small DPNs basic CO 4 sts without a slip knot. Row 2 (WS): Purl all sts on all WS-rows (you knit St st). Row 3: k2, yo, k2. Knit with yo-incr before and after the middle st.
Row 5: k2, yo, k1, yo, k2. Knit 2-6 rows St st. Begin to knit with decrs*. Row 1: k1, skp, k5, k2tog, k1. Row 3: k1, skp, k3, k2tog, k1. Row 5: k1, skp, k1, k2tog, k1. Row 7: k1, skp, k2. Row 9: k1, skp, k1. Row 11: k3tog or cdd. Another result with cdd in the middle. The leaf looks smaller and has a different shape. Look the photo. 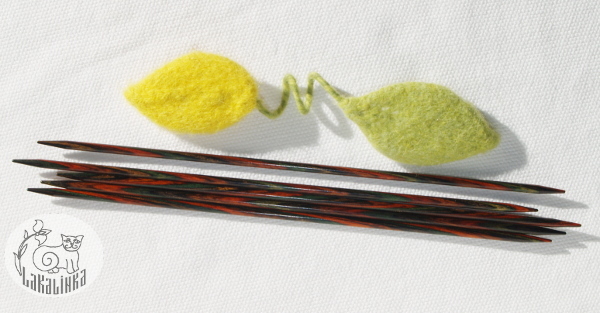 Break off yarn and use tapestry needle, thread through the remaining st and purl tight. Weave in ends. Wash the leaf in hot soapy water 3-6 minutes and felt. After rinsing, pull gently into shape. Leave to dry flat. 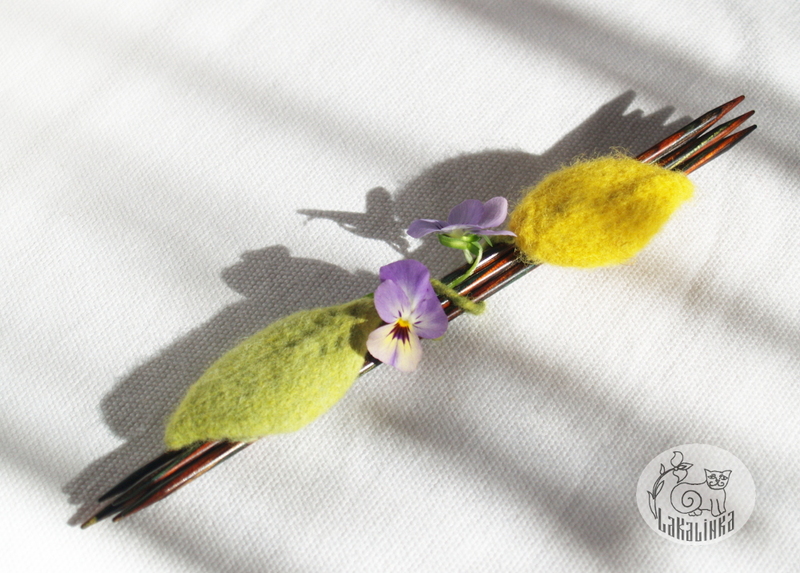 Continue reading: Photo tutorial for the felt wire with the finishing instructions.